Mosie's Bel Air Is His Latest Boulevard Beauty To Reign Over The Inland Empire. Like many boys when they’re growing up, Mosie Garland and his brother Billy were in love with cars. They were in constant contact with cars at work and on the weekends at various swap meets. Eventually they found themselves buying and selling Chevy Impalas and the like when they weren’t extremely popular. By the time that they became popular, Mosie and his brother had amassed quite the collection. As time went on, though, they wanted to be different and started to buy, sell and fix up vintage Chevy Bel Airs from the ’50s. This ’57 Bel Air is just one of the literally hundreds that have passed through Mosie’s hands. While at a swap meet a couple of years ago, Mosie mentioned to someone that he was looking for a ’57 convertible and they said that they had heard of one for sale… in San Francisco, California! Well, Mosie was on a flight from his home in Ontario, California, a week later to check out the car at a used car dealership/body shop. The car had been in a fender bender and was being repaired, but Mosie liked what he saw and left a deposit. 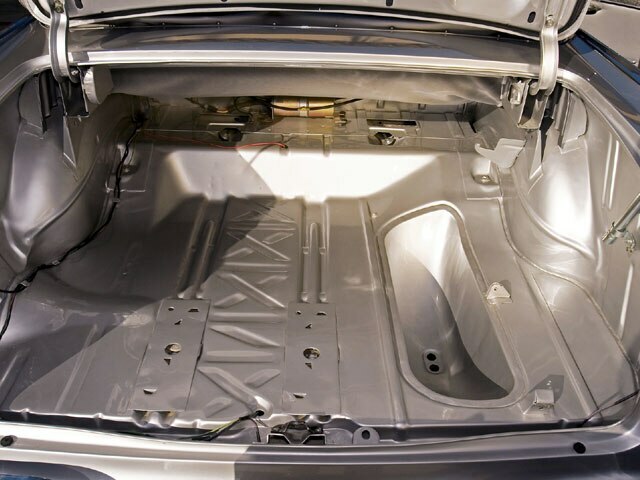 Two weeks later, he returned to pick up the repaired car and was initially going to trailer it home. But after a conversation with the salesman who ensured him that the car ran great, Mosie decided to be adventurous and drive the untested treasure home. As it turned out, the car made the eight-hour drive home without a hitch (pun intended). 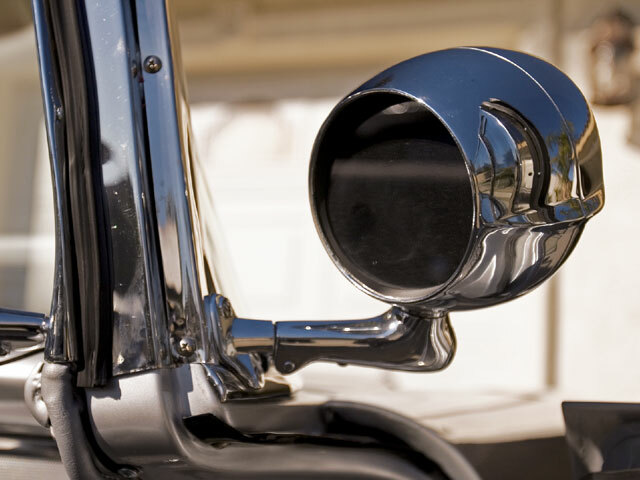 What happened next was a total rebuild of the ’57, which spanned a three-year period. 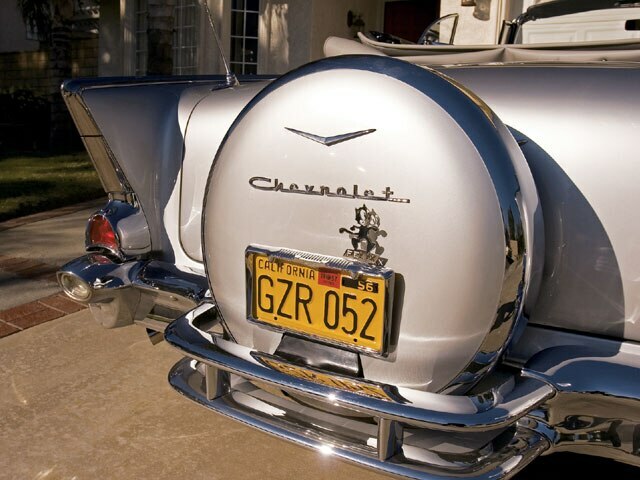 The end result was this super-clean ’57 which was photographed in Mosie’s backyard. 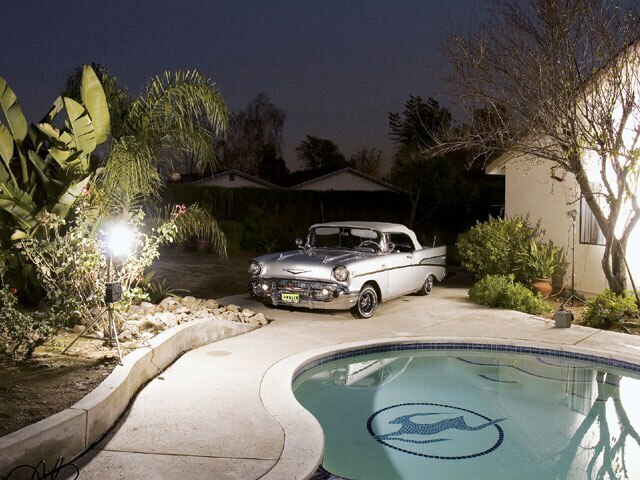 Mosie and his brother are known in the Inland Empire for building some of the cleanest cars, and to show their dedication, Mosie had Impala signs mounted in the bottom of his pool and spa. “Platinum ’57” is another notch in the already well-notched belt of Mosie Garland. Engine/Drivetrain: A 2006 GM 350-c.i.d. crate engine with stainless steel exhausts and ram jet injection was installed and connected to a polished 700R4 transmission at B&B Classics in Upland, California. Body/Paint: Fernando perfected the bodywork and then the car was painted in DuPont classic silver by “Baldo” at B&B Classics. 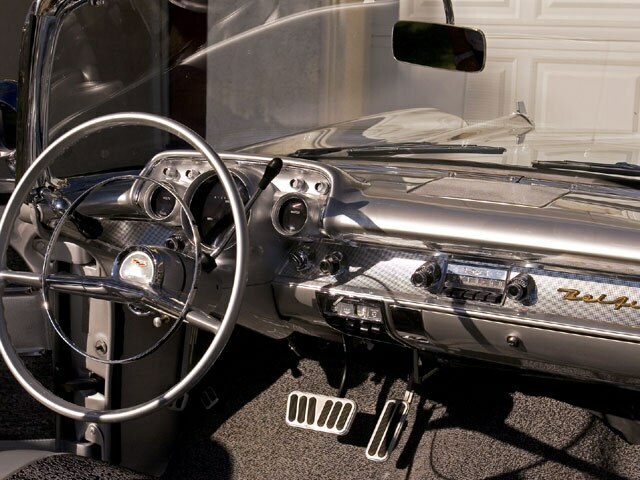 Interior: Joe at Joe’s Upholstery in Rosemead, California, used an OG upholstery kit with hardtop inserts. 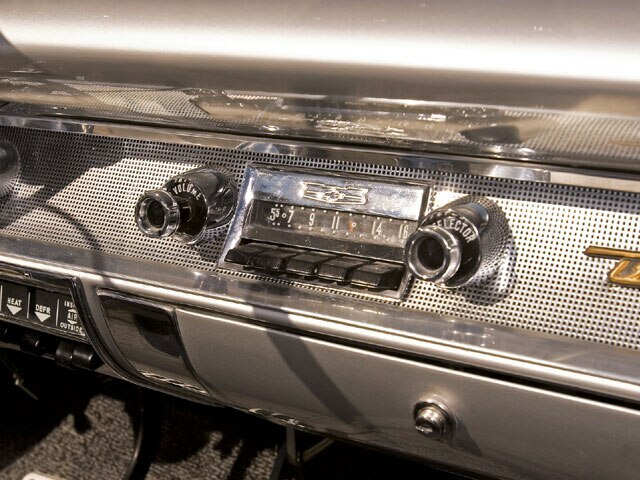 Sound System: A JVC head unit was installed in the glove box while a stock GM radio resides in the dash for show. The speakers are Alpine. Suspension: Stock but disc brakes were added for better stopping and good looks.